THIS WEEK GET READY FOR THE WORKS OF YOUR HANDS TO BE ESTABLISHED! Today I want to give you a simple answer. Yes a lot of factors may be included but one of the things that happen is that people come to church, they walk in and out of the church like everybody else. They are not actually believing in the principles that God has shown us in His word. Child of God answer this question for me; Is it possible for you to have a debt of £20,000 and within 6 marks the debt comes down. Is it possible to have a young adult come into this country in the number of months be granted Indefinite to remain? In the physical it may seem impossible through Jesus all things are possible. 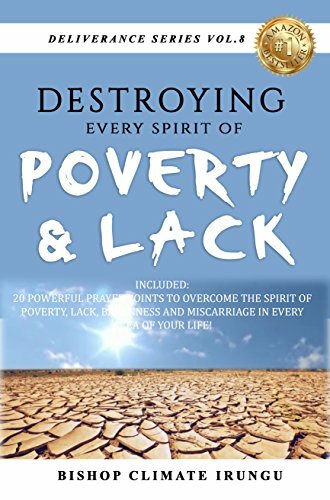 CLICK NOW TO DISCOVER HOW TO DESTROY EVERY SPIRIT OF POVERTY AND LACK! You see God wants to bless you and he wants to connect all favours to you. This week I need you to know as long as you put your trust in Him things in your life will begin to move. Remember that the prophetic word for this month is Divine Establishment and this month the works of your hands must be established. Your ideas, your family, your career, in your business in all areas of your life you will be established. This is why I get excited for you to join me for the Washing and Anointing of the Hands service! This is another opportunity for me to speak into your life, declare more of God’s blessings and for you to rise up in your faith and be anointed with favour, good news and prosperity. Child of God if you believe that this is the God that can do these things for you this Friday I need you to make extra effort to join with me. For too long have you been living in the land of just and not enough. It is time for you to be established. CLICK NOW TO DOWNLOAD – TRUTH ABOUT TITHE & OFFERING! Tuesday 13th November Kingdom Seniors at 7:30PM! Come for networking and biblical principles for all seniors. Join us Friday 16th November Come and join us for the After Sunset Miracle Service. Come and hear instant testimonies of healing, breakthrough and restoration. Join us Saturday 17th November Midnight Express 12AM – 1AM Come for the express prayer service that is breaking barriers and producing miracles! Super Sunday 18th November 2018!